Keywords: Internet, Networks, ARPANET, CSNET, USENET, BITNET, NSFNET, LISTSERV, State Libraries, Chief Officers of State Library Agencies, State Library Agencies, COSLA, LISTSERV, Electronic Mail, File Tansfer Protocol, Telnet, Local Area Networks, LAN, Wide-Area Networks, WAN, TCP/IP, High Performance Com-puting Act, National Research and Education Network, NREN, PACS-L, Public Access Computer Systems in Libraries, Online Public Access Catalogs, OPAC, Archie, Gopher, World Wide Web, Gateways. Of all the technological waves that have swept over our generation, I know of nothing that has happened with greater suddenness than the coming of the Internet. Scarcely a year ago, I suspect that most of those with whom we live and work had not heard of the Internet. The North American press, it seems, is just now becoming aware of the Internet: during June, July, and the first half of August of this year, the major newspapers carried 173 stories mentioning the Internet, compared to only twenty-two over the same period in 1992 (Wright, 1993, p. 20). Not that the Internet is all that new, nor that other networks did not precede it, for the Internet as we know it came into being over a decade ago, and was preceded by networks such as ARPA-NET (Department of Defense Advanced Research Projects Agency) that dated back to the late 1960s and USENET (User's Network) that developed in the late 1970s. The 1980s saw the coming of CSNET (Computer Science Network) and BITNET (Because It's Time Network), which operated primarily in the academic and research communities. The mid-1980s also saw the coming of the NSFNET (National Science Foundation Network), which has grown into a national backbone network and without which we would not have today's Internet. In recent years the Internet has changed the way that we relate to one another and, to some extent, the way in which nations relate to one another. It served as a means of communications during both the Tiananmen Square uprising in China and the coup attempt in the Soviet Union before the Soviet Union ceased to be. In what was once Yugoslavia, a Croat by the name of Wam Kat publishes what he calls "Zagreb Diary," which he produces on his own computer and sends to an electronic bulletin board in Germany (Cooke & Lehrer, 1993, p. 60). On my own computer, I was able to read first-hand reports from those who were caught by the flooding of the Mississippi River during the summer of 1993. Geographical and other boundaries fade away as people communicate with each other in cyberspace. The Internet is not just another network, but a worldwide network of computer networks built on local area networks (LANs) and wide-area networks (WANs). Because so many networks are interconnected within the Internet, it has been described by one writer as a "cloud of links"; trying to describe all of it and how it fits together, says this writer, "is a bit like trying to count the stars" (LaQuey, 1993, p. 22). The growth of this "cloud of links" has been, to extend the analogy, like a gathering storm of interconnected computers and users of those computers. A more prosaic but technical definition of the Internet is "the global, hierarchical interconnection of numerous local, mid-level, and wide-area networks, using the TCP/IP protocols, serving a large number of govern-ment, educational, and commercial institutions" (Sutton, 1993, p. 12). The Internet is different from such networks as CompuServe and Prodigy, not only in the sense that it is essentially non-commercial but that it is designed as "a way to provide access to all the thousands of scholarly and scientific databases and discussion networks around the world" (Hilts, 1993). In its early days, the Internet could claim only a few hundred registered computers. By 1989 that number had grown to over 80,000 (LaQuey, 1993, p. 7). Recent growth, by any standard, has been exponential. By January of 1992 the number of computers on the Internet had grown to approximately one million globally, serving 7.7 to 14.2 million individuals (Quarterman, 1992, cited in Warren, 1993). Vice President Al Gore is probably safe in saying that the amount of traffic on the Internet is now increasing at ten percent per month (LaQuey, 1993, p.6). It was Senator Gore, you will recall, who authored legislation leading to the High Performance Computing Act of 1992, which in turn is leading toward the development of the National Research and Education Network (NREN), which may well be our Internet of the future. The Internet is sometimes referred to as the interim NREN. Within these protocols operate the various applications of the Internet. They are the basic tools with which the searcher has to operate in order to take full advantage of what the Internet has to offer. For many years researchers have been using BITNET for e-mail purposes, and many of them still utilize BITNET addresses for that reason. Through electronic discussion groups and LISTSERVs, participants on the network are sharing vast amounts of information and ideas in a kind of extended electronic chit-chat, some of it substantive, some not. The LISTSERVs (for list servers) have been a particularly prolific means of bringing together people of like interests on topics of great and bewildering variety. LISTSERVs now number in the thousands, with at least one hun-dred of them devoted to library and information science. One of the biggest such groups, PACS-L (Public Access Computer Systems in Libraries), maintains a complete list of library-related discus-sion groups. Beyond e-mail messages, the LISTSERVs (and other electronic mailing lists as well) provide access to other documents of interest to their subscribers, including electronic journals and newsletters such as the ALA Washington Online Newsline (ALAWON). The Telnet protocol opens wide the doors to the online public access catalogs (OPACs) of libraries around the world by permitting the user to log in to their host computers. A number of menu-based software packages are available to facilitate the process of moving from country to country, from state to state, and from library to library. The MELVYL catalog in California, for example, provides access to 5.5 million unique titles representing nearly 11 million holdings in the University of California system, the California State Library, and the Center for Research Libraries. Telnet can also be used to access other bulletin board systems, freenets such as the Cleveland Freenet, and the varied resources of campus-wide information systems (CWISs). The Internet is a convenient mechanism for carrying out surveys quickly and with a minimum of paperwork. Recently, Internet Society president Vinton Serf polled 150,000 colleagues on the network asking for suggestions before testifying before the House Committee on Science, Space and Technology (Larkin, 1993). A recent initiative by the Chief Officers of State Library Agencies (COSLA) was not as sweeping as this study but no less effective in meeting its objectives. 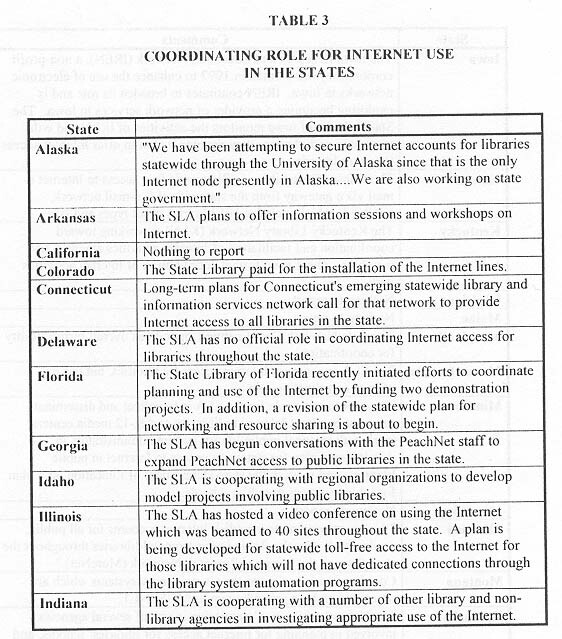 In early 1993, the Network Committee of COSLA undertook a survey of all state library agencies (SLAs) in the United States to determine the "State of the Internet in the States" as of May 1993. The Chief Officers all bear certain responsibilities for statewide network development in the respective states, and thus have a unique "bird's eye view" of Internet utilization. COSLA is an independent organization of the chief officers of state and territorial agencies designated as the state library administrative agency and responsible for statewide library develop-ment. Its purpose is to identify and address issues of common concern and national interest; to further state library agency relationships with federal government and national organizations; and to initiate cooperative action for the improvement of library services to the people of the United States (COSLA Directory, 1993). Its membership consists solely of these top library officers of the states and territories, variously designated as state librarian, commissioner, or executive secretary. It provides a con-tinuing mechanism for dealing with the problems and challenges faced by the heads of the state agencies which are responsible for statewide library development (COSLA Directory, 1993). Concerns of COSLA include effective statewide planning and action to ensure library service adequate to meet the needs of all communities; the strengthening of state library agencies, library systems and effective networks; federal appropriations for library services; national library service programs; use of new technology for library and information service; state library services; avai-lability of state and federal documents; improved library statistics programs; continuing library education programs; and state-federal responsibilities for talking book service to blind and handi-capped persons through the nation (COSLA Directory, 1993). The survey itself was a demonstration of the utility of the Internet. The instrument was generated on an office computer and was then sent to the COSLA LISTSERV in Denver, which then distributed the message to all the state library agencies currently on the network. (Paper copies of the survey were also sent to state library agencies not yet on the Internet.) Responses were returned electronically to the headquarters of the Council of State Governments (CSG) in Lexington, Ken-tucky, whose staff compiled the results on computer before producing a printed copy of the respon-ses, organized by question and under each question by state. There was no necessity for a paper copy at any point in the development of the summary report, although it is likely that personnel in the responding agencies printed out drafts for internal review before sending their report to the CSG. Compared to a conventional mail survey, this survey was carried out with the minimum of paper-work and within a remarkably short period of time. � Other addresses of importance The current paper provides an analysis of the responses through "future plans," although the other data, which appears in the CSG report, should be of use to COSLA members. This kind of survey is not subject to meaningful statistical analysis. It is an overview, a snap-shot if you will, of the state of the Internet as seen by the Chief Officers of State Library Agencies as of mid-year 1993, a year in which the picture has been changing rapidly. By the time the results were compiled, many of the plans reported by the various states were already being implemented and, undoubtedly, others being formulated. Responses were received from 41 state library agencies out of 48 member states. The District of Columbia and Guam were invited to participate in the survey but did not respond. The tables that appear at the end of this article provide summaries of the responses of the first nine areas of inquiry. It should be noted that lack of response from some state library agencies does not necessarily imply that there is no Internet activity in those states. Within the tables themselves, "Nothing to report" indicates that a state did not respond to that particular question, whereas it may have responded to other questions. 1993. In order to illustrate the range of use of the three basic applications of the Internet (e-mail, remote login, and FTP), I have attempted to represent such use by state, even though the question was not stated in such a way as to elicit precise responses in this area. Nevertheless, it was not difficult to infer these applications from most of the responses that we received. 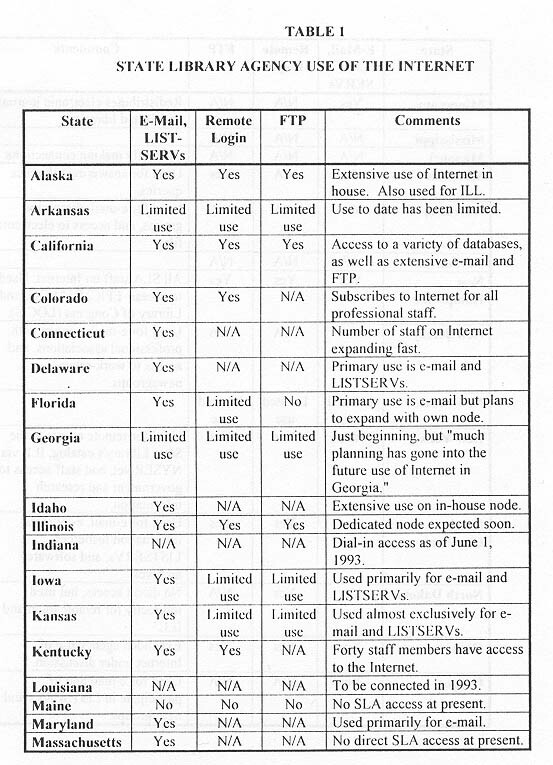 For the sake of brevity of reporting, I have combined the summaries in two of the tables: Table 2 incorporates responses regarding the gateways used for Internet access and the sources of funding for Internet access, and Table 4 incorporates responses concerning Internet activities among public libraries and other types of libraries as well. The primary uses of the Internet in state library agencies are for electronic mail and subscrip-tions to LISTSERVs, or discussion forums; secondary usage is for access to remote computers, catalogs and databases, and to send or receive documents through FTP. At least five states men-tioned the use of the Internet for interlibrary loan (ILL)--usually for searching other library online public access catalogs. A number of SLAs reported that they were in the early stages of Internet use, or that they were not actually online as of the date of the survey. Some states, e.g., Alaska, California, Washington, Wisconsin, appear to make extensive and varied use of the Internet. Given the wealth of information available via FTP, it was surprising how many SLAs did not report any activity in this area. One might assume that those agencies supporting strong research libraries are, or soon will be, those which make greater use of FTP. 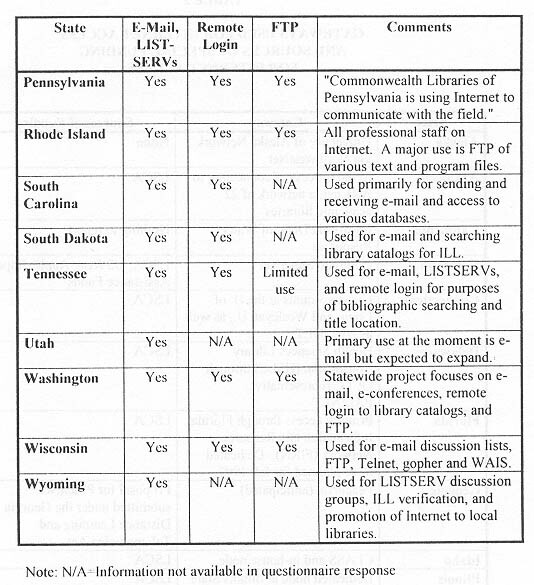 See Table 1, "State Library Agency Use of the Internet," for more information [at the end of the paper]. SLAs use a wide range of "gateways" (access points) to the Internet, including both interstate and intrastate networks. At this stage in Internet utilization, many of the personnel in state library agencies appear to rely on university computer centers or libraries for their access to the Internet; several mentioned guest accounts with universities that have provided first access to the Internet. In the meantime, states from coast to coast are busy putting together networks that will provide ongo-ing access to the Internet on the part of all libraries, including public libraries, for which state library agencies often have primary responsibility at the state level. Only a few, e.g., Colorado, have res-ponsibility for school library development. At this stage of development, states report few special sources of funding other than the Library Services and Construction Act (LSCA), but the search for other sources is clearly underway in many states. Only one state, Utah, reports receiving substantial state appropriations for Internet access, although networks such as NYSERNet in New York depend, at least in part, on state funding. Some states are looking to the federal government for assistance: Iowa has applied for a Title II-B grant and South Dakota to the National Science Foundation. The Nebraska Library Commission reported a grant from the Nebraska Telephone Association. It is worth noting that Carol Henderson of the Washington Office of the American Library Association recently commissioned a study of Internet activities supported by LSCA funds. A preliminary report prepared by Dawn Williams was released August 2; a final report should follow soon. In her report, Williams found that 25 states are using LSCA Title I and/or Title III funds for Internet/NREN activities. Williams also gives specific examples of activities for which LSCA moneys have been spent (Williams, 1993). 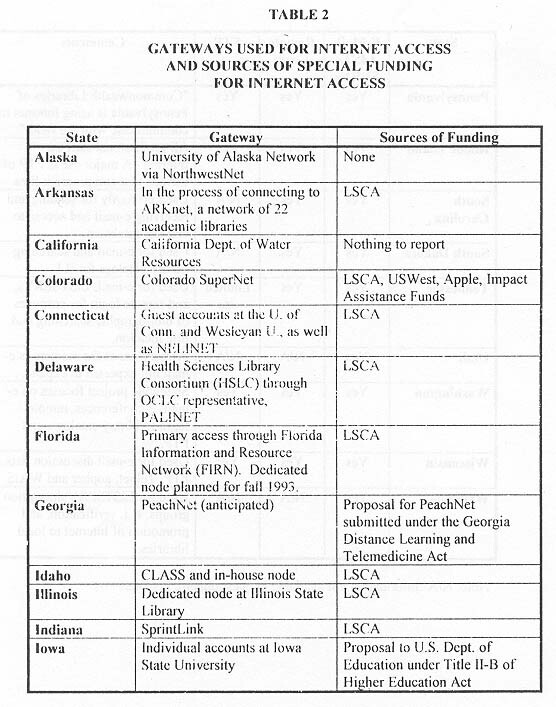 See Table 2, "Gateways Used for Internet Access and Special Funding for Internet Access," for more information [at the end of the paper]. Most states are "in the process of" defining the coordinating role, with responsibility falling both to SLAs and other agencies. The day has not yet come when the SLAs have seized the initiative in coordinating Internet use in the states, although many of the states have developed their own statewide databases and/or interlibrary loan networks. Leaders from state library agencies are now "meeting with" and "cooperating with" those agency personnel who have, often by default, found themselves with the keys to the kingdom, i.e., Internet access, but have not yet thought in terms of statewide networks that would include, among other agencies, public libraries. This is one of several areas that should look quite different a mere year from now, for the level of activity appears to be very high and growing very fast. 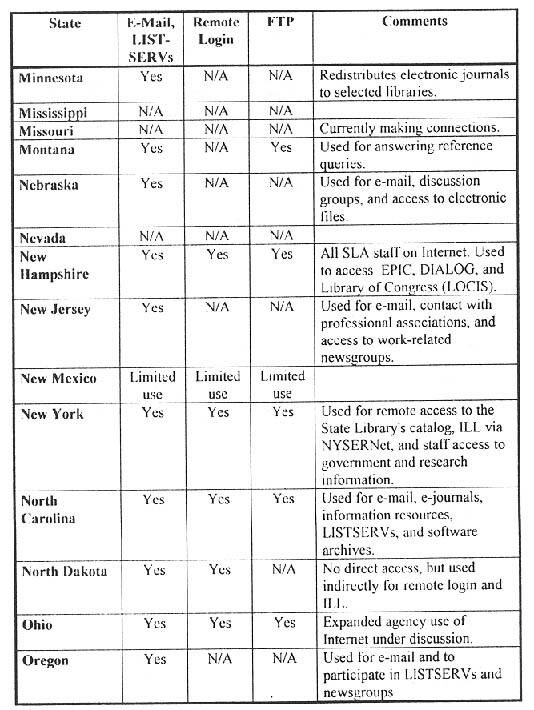 See Table 3, "Coordinating Role for Internet Use in the States," for more information [at the end of the paper]. Very few states report extensive use of the Internet among public libraries as of the date of this survey, but many reported plans for widespread utilization. Some states such as Tennessee report activity among the larger public libraries, and others, e.g., Connecticut, Delaware, Florida, New York, Washington, report pilot projects involving public libraries. Many states report widespread use of the Internet among college and university libraries, citing examples both of specific institutions and consortia. It appears that the state library agencies as well as the public libraries have had to look to the academic and research community for access to the Internet, even in states where other statewide networks already existed. McClure et al. are probably correct in saying that "the public library community knows far less about Internet/NREN developments than the academic or special libraries, and is less likely to understand the potential impact of national networking initiatives" (McClure, 1993). But the gap is closing fast as state library agencies and the public libraries of their respective states assume their parts in the development of networks that will give them access to the Internet and, ultimately, to NREN itself. See Table 4, "Internet Activities Among Public and Other Types of Libraries," for more information [at the end of the paper]. Use of LISTSERVs and news groups by state library agencies is widespread, with some SLAs (Idaho, Kentucky, and Wisconsin) subscribing to over 15 LISTSERVs. Most of the states reporting subscribe to less than 10. Among the LISTSERVs most often cited are PACS-L (11), PUBLIB (11), GOVDOC-L (8), and LIBREF-L (8); many states also reported subscriptions to electronic journals and newsletters, the most frequent citation being the ALA Washington Online Newsline (ALAWON). Surprisingly, only two states reported subscriptions to NETTRAIN, which focuses on training for network use. One notable finding here is the sheer number of LISTSERVs to which the SLAs subscribe to in the aggregate: the 41 agencies subscribe to 90 different LISTSERVs (counting ALAWON, which is a newsletter that shows up on several LISTSERVs). COSLA now has its own LISTSERV and the state library agencies are beginning to participate in this forum on matters of mutual interest. The number of LISTSERVs and other services to which a state library agency subscribes is, in all probability, related to the number of staff members who have accounts, for the traffic on some LISTSERVs, such as PACS-L, can be heavy and time-consuming. Like many other aspects of Internet use, subscription to and participation in LISTSERVs and other computer forums is just now taking shape and will undoubtedly change as more and more personnel become connected to the Internet. See Table 5, "State Library Agency Use of LISTSERVs and Electronic Journals," for more information [at the end of the paper]. SLAs report some examples of training for Internet use, some of them in the SLAs, some in other agencies. Until the time of this survey, most of the training appears to have been offered by agencies other than the SLAs, but a few states, notably Alaska, Illinois (videoconference), New York, and Washington have offered courses that reach well beyond their own personnel. Others are taking advantage of existing training for their own staff, as a prelude to developing courses or workshops for their own constituencies. See Table 6, "Internet Training Activities Now Underway in the States," for more information [at the end of the paper]. Interstate and intrastate planning for network development is well underway in many states, with various points of access, various participating institutions, and various types of use foreseen. Although one state reported that "the future is today," clearly implementation of many of the plans has yet to be realized. Activities range from creating library legislation to govern and fund networks (Maine and Missouri) to developing or expanding networks that will provide universal access to the Internet (Georgia, Indiana, and Maryland). As already mentioned, still other states are developing pilot projects with public libraries and other agencies before committing major resources to Internet access, while others are seeking special grants from state, federal, and private sources. See Table 7, "Future Plans for Internet Development," for more information [at the end of the paper]. Like the Internet itself, the status of Internet use, as seen by the Chief Officers of State Library Agencies, might be described as a "cloud of links," and a changing one at that. Virtually all state library agencies responding to the survey mentioned some kind of linkage with existing or emerging networks. The nature of those networks is still taking shape as state library agencies and public libraries come to grips with the realities of the Internet revolution. To whatever extent those networks were under development before the full impact of the Internet became apparent, the coming of the Internet has undoubtedly provided network development with a major boost. It now remains to be seen just how fast this picture will change. It is the intent of the COSLA Network Committee to update this study within a year and to compare the state of the Internet in the States from one year to another. The current study was undertaken in broad strokes to provide an overview of Internet activities as seen by the Chief Officers. Some of the terms used are themselves evolving and taking on special significance. A future study should include, among other features, more precise questions, definitions of terms used in the survey, and should deal more in depth with other Internet applications such as the gopher, WAIS, and the World-Wide Web--as well as other applications that are surely yet to be developed. Cooke, Kevin, and Lehrer, Dan., "The whole world is talking," The Nation, 257: 60 (July 12, 1993). COSLA Directory: State Library Agencies, Consultants and Administrative Staff, 1993. Lexington, KY: Chief Officers of State Library Agencies through the Council of State Governments, 1993. prefatory page. Hilts, Paul, "(Inter)Net effects," Publishers Weekly, 240: 40 (June 28, 1993). LaQuey, Tracy. The Internet Companion: A Beginner's Guide to Global Networking. New York: Addison-Wesley Publishing Company, 1993. McClure, Charles R.; McKenna, Mary; Moen, William E., and Ryan, Joe, "Toward a virtual library: Internet and the National Research and Education Network," in Bowker Annual Library and Book Trade Almanac. 38th ed. New Providence, NJ: R. R. Bowker, 1993. pp. 25-45. Sutton, Brett. "Using the National Research & Education Network: An Illinois State Library Videoconference." March 24, 1993. Warren, Jim, "The year of the Internet," Government Technology, 6: 22, (July 1993). Williams, Dawn. 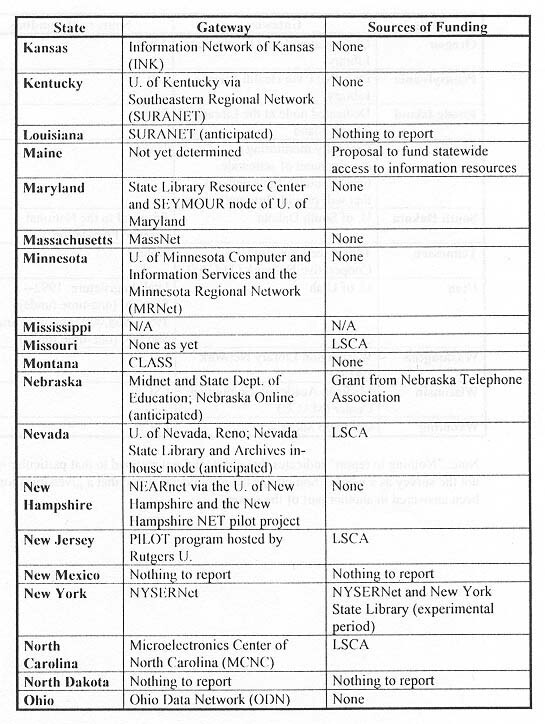 LSCA Support of Internet-Related Projects: Results of Survey of State Library Agencies. Chicago, IL: American Library Association, 1993. Wright, Robert, "Voice of America," New Republic, September 13, 1993, p. 20. Bailey, Charles W., Jr., "Library Oriented Lists and Electronic Serials." Available from PACS-L (PACS-L@UHUPVM!) and other LISTSERVs. CATALIST. [A menu system for automating access to library resources on the Internet] Source: zebra.acs.udel.edu. Directory: pub/library. Farley, Laine, ed. Library Resources on the Internet: Strategies for Selection and Use. RASD Occasional Papers, Number 12. Chicago, IL: Reference and Adult Services Division, American Library Association, 1992. 43 p.
Hytelnet. [A menu system for automating access to library resources on the Internet] Source: access.usask.ca. Directory: pub/hytelnet/pc. File: hyteln64.zip. Kehoe, Brendan P. Zen and the Art of the Internet: A Beginner's Guide to the Internet. 2nd ed. Englewood Cliffs, NJ: Prentice Hall, 1993. Kesselman, Martin, "The Internet," Wilson Library Bulletin, March 1992, pp. 76-78. Kessler, Jack. Twenty of the Most Commonly-Asked Questions About the Internet. San Jose, CA: Cooperative Library Agency for Systems and Services (CLASS), n.d.
Krol, Ed. The Whole Internet. Sebastopol, CA: O'Reilly & Associates, 1992. Larkin, John L., "Local Governments Enter the Information Age," PA Times, 16: 3 (August 1, 1993). LIBTEL. [A menu system for automating access to library resources on the Internet] Source: ftp.unt.edu. Directory: library. See libtel files. Notess, Greg R., "Gaining Access to the Internet," Online, September 1992, pp. 27-34. NYSERNet New User's Guide to Useful and Unique Resources on the Internet. Albany, NY: NYSERNet, Inc., 1992. St. George, Art, and Larsen, Ron. Internet-Accessible Library Catalogs and Databases. Albuquerque, NM: University of New Mexico, 1992. Source: listserv@unmvm.bitnet. Message: "Get library package"
Strangelove, Michael. Directory of Electronic Journals and Newsletters. Ottawa, University of Ottawa, 1991. Source: comserve@vm.ecs.rpi.edu. Message: "Send Ejournl1 Sources" and "Send Ejournl2 Sources"
Tennant, Roy; Ober, John; and Lipow, Anne G. Crossing the Internet Threshold: An Instructional Handbook. Berkeley, CA: Library Solutions Press, 1993. Tillman, Hope N., and Ladner, Sharyn J., "Special librarians and the INTERNET," Special Libraries, 83: 127-131, (Spring 1992). US. National Science Foundation, Network Information Center, Comp. Internet Resources Guide. Source: nnsc.nsf.net. Directory: resources-guide. Files: various filenames.